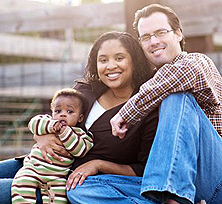 Adoption FAQ: Is Working with a Christian Adoption Professional Important? I believe that it is, but sometimes it is not always possible. For instance, if you are adopting through your state or county, you will be working with governmental entities or government contracts. Choosing a Christian provider will not usually be possible. With the dawn of the internet, came the ease with which many organizations are able to offer nationwide adoption help. That opened up the opportunities for families to have a wider variety of professionals to choose from. Keep in mind that you will work with many adoption professionals during your adoption. While their values are important, so too is their adoption experience. You should ensure that you are working with a professional who has years of experience in the type of adoption you are seeking — don’t choose one based on their faith alone. Similarly, don’t choose an attorney or home study provider who may offer you a very low price because they are friends of a friend or someone from church. You need to know that the professional you are entrusting your family to is qualified and experienced to get the job done. It is always acceptable to state that your family has Christian faith and values, and you are hoping to work with someone who shares that. It is especially important during the wait to adoption for Christian families. We know that our wait is often in God’s time, and having an adoption professional who can help and encourage you from the same perspective is invaluable! I often say that your family is the most important thing you will ever build, yet many people put more thought into a home remodel or vacation plans. Take the time to get to know who you want to work with. Pray about it. And trust that God will guide you where He would have you be. In Matthew 25:14-30 Jesus uses the parable of the talents to reveal His desire for us to use His gifts wisely. When we invest the gifts and actual talents God gives each of us wisely we build confidence and trust in His provisions, and repay His trust in our ability to tend His gifts with care. Often this lesson is preached as a way to manage finances or material gain. But God’s provisions aren’t always material. He gives us each gifts, talents, and abilities which are unique and totally qualified for use right now, as well as in the future when He calls upon them. Along a path to parenthood, God awards gifts such as a yearning to be a parent, a nurturing heart, and patience for children. But sometimes when hopeful parents endure hurdles or waiting as they attempt to build their family, those initial gifts and talents for parenting feel more like burdens. It’s easy to wonder why you’d be given talents or abilities, or the desire, if you couldn’t use them yet. Some will even fear their gift will never be used. If you’re hoping to become a parent, or grow your family, reflect on the probability that God may have given you the desire and knack for parenthood because He’s preparing you for the child in your future. As you wait for your child, find ways to use your gifts for nurturing or care-giving to bless others. Invest your talents now in a way that will benefit your future as a parent. Finally, consider the possibility that the calling to parenthood is a gift too. God will not invest such a gift if He doesn’t have plans to harvest it. Through prayer, discern how He may be leading you to use your passions, dreams, gifts and talents. He will reveal his immediate steps that will ultimately lead you to His plan for your future as a parent. How will you respond when He asks you invested His gift? If you feel called to build your family through adoption, take the steps necessary to explore and pursue this option. Learn more or apply to adopt! Are Adoptive Families ‘True’ Families? Yes, we all know that there are several laws and regulations in most countries that make adoption legal. But, did you know that adoption existed in Biblical times as a legal option? According to the Word of God, the adopted child enjoyed the privilege of becoming a legitimate heir to the father’s estate and was treated as one among the family. The adopted child was treated as someone ‘born into’ the new family and as someone who has just started a new life! There are many examples of adoption in the Bible: Esther’s adoption by her cousin Mordecai, Moses’ adoption by Pharaoh’s daughter, and Joseph’s acceptance of Jesus as his son. God even adopted the entire tribe of Levi as His own. The Bible indicates that there is no difference in the roles and responsibilities of parents and children, whether the child is biological or adopted. Adoptive families are ‘real’ families in the eyes of God and in the eyes of law. All believers are children of God and they are heirs through adoption (Rom. 8:15–17, 23; Gal. 4:4–7). This makes each of us a part of God’s adoptive family. God uses adoption as a beautiful metaphor to describe His relationship with those who believe in Him and His resurrection. This gives us the privilege of calling Him “Abba”, which is Aramaic for Daddy and is a Jewish expression of closeness of children with their fathers. In other words, a Christian’s identity is this: I am adopted by God (Eph 1:5). As believers we enjoy the rights, privileges, inheritance of biological children. This is by the law of grace. The same grace is now available to adoptive families. Every child is a blessing from God (Ps. 128:3) and Christian adoption enables you to build a home with God’s Word as the foundation. Any family that is built on God’s Word will stand the test of time and will be used to extend His Kingdom, whether biological or adoptive! How to Trust God When You Feel It Is the Last Thing You Can Do! It is every woman’s dream to hold her first baby in her arms. There is nothing more painful yet joyful as giving birth to your child. You think you are ready to start a family and imagine everything will happen “just as planned.” After all, isn’t that how it is with all the other women you know? But, after 12 months of ‘trying’, you find out that you are now medically an infertile couple. It is devastating news and one that you wouldn’t wish on your worst enemy. But, is it the end of the road? Will you never become a mother? Do you feel God has let you down? I want to encourage you to meditate on those biblical verses that talk about God’s will and plan for His children (Psalm 25:12, Psalm 32:8, Psalm 37:4,7, Proverbs 2:6-9, 1 Cor. 10:13, Isaiah 58:11) God promises that He has plans to bless us and not harm us…plans to give us a hope and a future. There are times when the plans in our head do not match the plans that God has prepared for us. But, if you trust in Him and take that leap of faith, you will be pleasantly surprised at how God was able to work your darkest hour into a bright and sunny day! Whether you want to try assisted reproduction treatments or want to consider adoption, invite God into the situation. Trust that God, in His wisdom, is trying to make something out of you through this difficult time. Ask Him to guide you towards His divine plan for your parenthood and show you what He wants you to do. If you are considering adoption, take a step back and check if your motives are pure: Do you want to become a parent or do you want a biological child? You cannot adopt a child for selfish reasons i.e., to make you a mother or to fill a void. An adopted child is no different from a biological one. The former is born of your heart while the latter is born of your body! God has prepared a child for you. Be strong and persevere in prayer until He leads you to your child. God’s Blessings Come in ‘Can-s’ – Yes, You CAN Trust Him For Your Miracle! This was what Mary said when she met Elizabeth in Judah. Mary was probably 19 years old when the angel of the Lord met and proclaimed to her that she would bear the Son of God. The angel also announced that her relative Elizabeth has conceived despite her barrenness, for “with God nothing will be impossible” (Luke 1:37). It is a wonderful scene where these two women meet. Elizabeth was old and barren, yet with child, while Mary was very young and pregnant without ‘knowing a man’. We see God’s hand in both these miracles that defy the natural order of things. Most of us suffering from infertility may wonder why God is putting us through this trauma, when He can heal us ‘right away’ and make us pregnant. Well, if there’s one thing we need to know about God, it’s this: He cannot be confined in a neat box! He has many acts up His sleeve and is the sovereign God who decides how and when to answer our prayers. There are times when God will do the unexpected and take us on a path we never even dreamed of. I believe the person who said “The longest journey of any person is the journey inward”, had a long walk with God! Our struggles with infertility can be a wonderful opportunity to get rid of all the spiritual, mental, and emotional infections and dirt that have slowed us down in our walk of faith. When we trust in, rely on, and put our confidence in the Rock of Ages, we embark on an exciting journey that will take us to the place of complete rest, peace, and joy in Christ. God works in ways that are beyond our comprehension. Sometimes, we may not like what He has planned for us. But, if we believe that we are in His thoughts and He has good plans that give us a hope and a future (Jeremiah 29:11), we will welcome any surprise He throws at us. Christian adoption may be one of the surprises God has in store for infertile couples. He knows the inborn yearning in every woman to become a mother and He understands this feeling. Adoption may be His way of meeting your need to become a mother and giving a life of comfort, security, love, and faith to a child who needs you, more than you need him or her. For my journey to motherhood, this is exactly how God worked. I lost pregnancy after pregnancy in an attempt to become a mother the only way I knew how. When I finally received the news that a successful pregnancy was not going to be an option, I prayed that God would remove this great desire to be a mother if it was not in His plans for my life. It was then, that He opened a window in my darkest days of desperation, as if to say “Mardie, simply follow MY path for your life.” God’s path led me through an adoption journey that blessed me not only with my son, but also with the work I do today through Lifetime Adoption Center. Two miracles that would not have existed for me had I not followed God’s leading. If you are confused about adoption or your journey to parenthood, I encourage you to spend some time today in prayer. Ask God to show you what to do and lead you in your decisions concerning adoption. Believe that one day you will have a child who will rise up and call you blessed! Most Christians looking to adopt are not aware of the financial aspects of adoption. Domestic adoptions through public agencies are the least expensive. Adoptions through private agencies, independent sources, and international adoptions can range anywhere from $15,000 to a whopping $45,000. If you are contemplating adoption, these figures should not put you off. Why? Well, think of it as an investment – an investment in a life! Surely this cannot compare with all the other material things we save up for and purchase, such as cars and homes? If the costs involved in adopting a child appear to be overwhelming, then ask God to provide the financial resources to help you bring home the child He has waiting for you. Jesus is a specialist in impossibilities. So, commit your finances to Him and be confident that God will provide for your financial needs. Of course, you must also work out a specific budget to understand how much you may have to pay. The costs will include adoption agency fees, facilitation fees, home study fees, and additional expenses in case of medical exams, interstate adoptions, and so on. Be sure to contact the concerned professional to get the fee schedule, additional costs, and terms of payment in writing. You may find that you will have to sell a few of your favorite items to meet the costs or scrimp and save for a few months to lessen your financial burden. But, if it will give you a lifetime of loving and protecting a child, it is worth every cent. If God has placed the desire to adopt in your heart, you can rest assured that He will provide the means for it. As Philippians 4:6 urges, don’t worry about your finances, but praise Him and thank Him in every situation and He will bring His plans to pass.